"Etzioni's argument is a breath of fresh air in the current debate. Compared to most of his colleagues on the left, he is both more hard-headed about security and more understanding of the critical role of religion and moral culture in maintaining social order without violence. This book is a must read." "Etzioni offers a far ranging alternative perspective for the formulation and conduct of U.S. foreign policy. Security First offers to be an outstanding and important work." "After foreign policy disasters from Rwanda to 9-11 to the Iraq War, alternatives to realist, liberal, and neoconservative shibboleths are desperately needed. 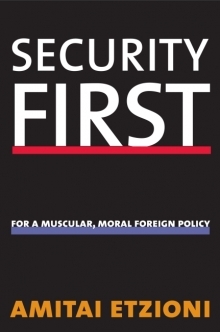 Learned but accessible, sweeping yet detailed, Security First offers a distinctive approach that can help America forge a new path."